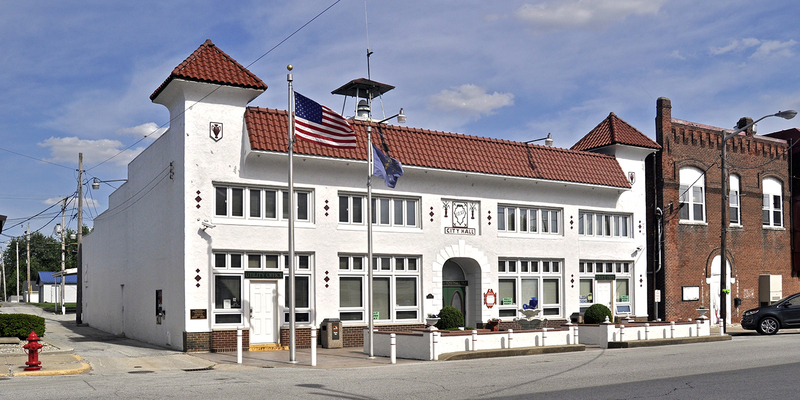 A grant from Indiana Landmarks’ Partners in Preservation Program (PIP) will help nominate the Greentown Commercial Historic District to the National Register of Historic Places. Founded in 1848, Greentown was a comparatively quiet burg just east of Kokomo until the discovery of natural gas in 1877 fueled industrial development and a building boom. Chief among the companies that set up manufacturing plants in Greentown, the Indiana Tumbler and Goblet Company became famous for its products, which remain popular with collectors today. 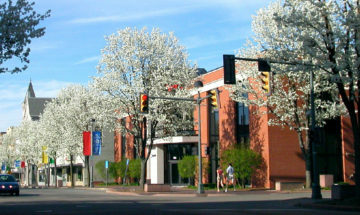 Greentown’s commercial district thrived in the late-nineteenth and early-twentieth centuries, with a bank, theater, lodges, churches, and an impressive City Hall, which also houses the Greentown Glass Museum. 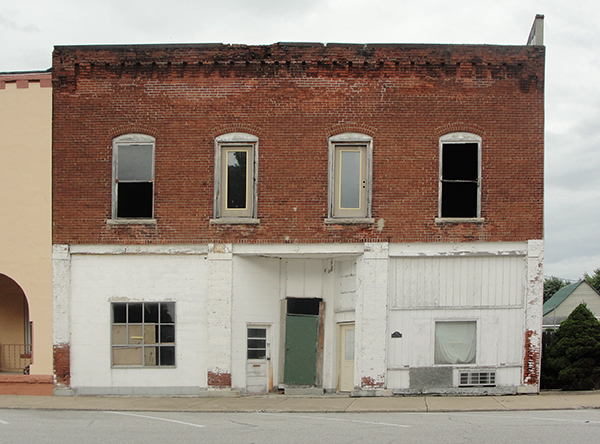 A grant from Indiana Landmarks’ Partners in Preservation Program (PIP) will help nominate the Greentown Commercial Historic District to the National Register of Historic Places. The new district will include 30 historic structures. The Greentown Historical Society leads preservation efforts in the small Howard County community. The group is spearheading the nomination to encourage downtown revitalization. National Register status creates eligibility for grants and tax credits for restoration. Indiana Landmarks has partnered with the Greentown Historical Society on other preservation projects in the community. 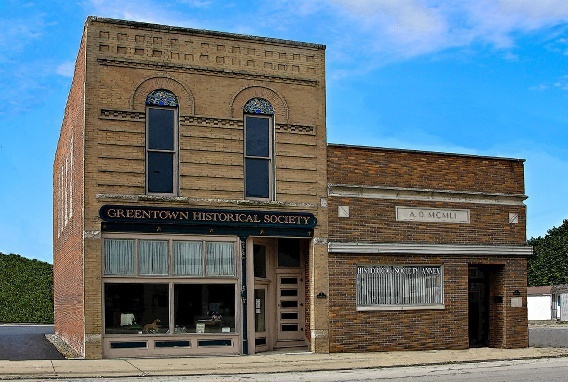 The group received loans from Indiana Landmarks to acquire and rehabilitate two commercial buildings in the proposed district as the Greentown History Center. The facility houses over 1,000 artifacts associated with local history, a gift shop, and space for exhibits. Indiana Landmarks’ covenants protect the structures from demolition or inappropriate exterior alterations. In 2015, the Greentown Historical Society saved the former Star Theater, swinging into action when the town considered condemning the dilapidated building. 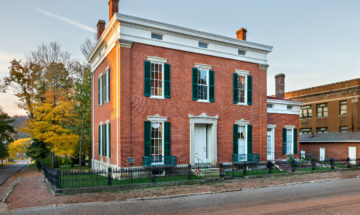 The Historical Society used an Efroymson Family Endangered Places Grant from Indiana Landmarks for an architectural feasibility study on the building. Shortly thereafter, one of the group’s members acquired the building and began stabilization. He plans to rehab the former theater to include commercial space on the first floor, with apartments on the second floor. 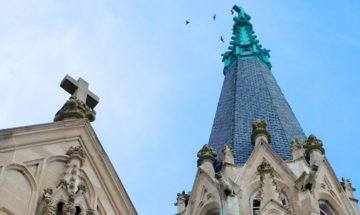 For more information about Indiana Landmarks grant programs and the Greentown historic district nomination, contact Mark Dollase, Vice President of Preservation Services, 317-639-4534 or mdollase@indianalandmarks.org. To learn more about the Greentown Historical Society, visit http://www.greentownhistory.org/.